Tendering and procurement for this project was handled by the Dock Yard Procurement Department and Project Manager. The tendering process called for Hoist & Winch Ltd to carry out a pre-tender survey on one of the 3 – off troop carrying ships in order to check overall hoist dimensional clearances within the tight confines of the ship, and to discuss and recommend hoist operating speeds. These hoist units were also required to feature a rack and pinion cross travel drive motion feature to still allow the hoist units to operate, subject to the wave motion applied to the ships during day to day service. This was followed by a staged hoist installation programme over a 2 year period for the 3- off ships, which also included load testing of hoist runway beams installed by the dockyard. 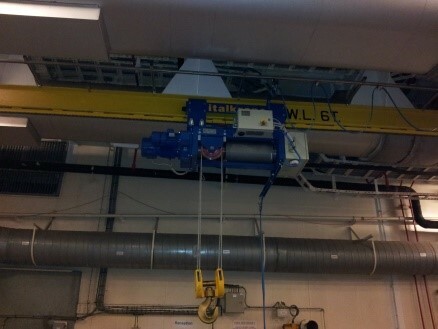 To facilitate hoist installation, Hoist & Winch Ltd worked from a mobile scaffold tower using 4 - off Yale manual chain hoists and 2- off “T” Bar design lifting frames, clipped to the top flange of the hoist runway beam. Handover on completion of all work included handover witness by the RFA Ship Chief Engineer, as well as the dockyard Project Manager. On completion, Hoist & Winch Ltd issued a LOLER Thorough Examination Report for the completed electric wire rope hoist with rack & pinion drive and the hoist unit runway beam installation work. All site installation work was again subject to very stringent planning requirements, which required very carefully documented Risk Assessments and Method Statements, which were reviewed/agreed by the Project Manager and the Safety Department before any work could commence.